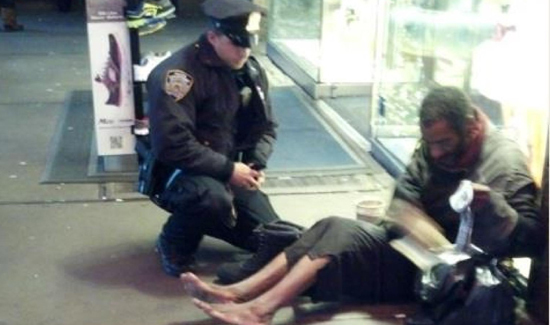 A couple of Norridge (IL) police officers were observed purchasing new shoes for a homeless man and then watching to make sure they fit. They did this not knowing someone had taken a picture and did not wish to be personally recognized. WBBM spoke with the two officers by telephone to talk about the good deed. They said they were called Dec. 29 to a bus shelter, where a homeless man was sitting with a bunch of blankets. He reportedly said he had wanted to board a bus, but was told he couldn’t do so because he didn’t have shoes. The officers say the man’s shoes had no soles on them. So, they decided to buy him a pair of boots. The officers went to Payless and picked out a $60 pair, size 15 ½. The officers say the man expressed his appreciation, shaking their hands, and telling them he could now go and try to find a job. The officers say the good deed makes them feel good. They insisted on remaining anonymous.